Qualcomm is throwing its hat into the VR ring with a reference headset that, looking long-term, it hopes will lead to lower cost solutions en route to mass consumer adoption of VR. 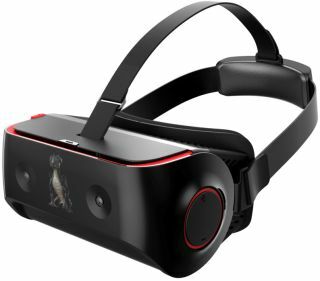 As its name implies, Qualcomm's Snapdragon VR820 headset is powered by its own Snapdragon 820 System-on-Chip (SoC) with an Adreno 530 GPU. It's integrated into the headset itself, so there's no external hardware required—it doesn't need to be plugged into a PC like the Oculus Rift and HTC Vive, nor does it require a smartphone like Samsung's Gear VR. Qualcomm feels its experience building chipsets with graphics, audio, and sensor technologies makes it uniquely positioned to bring VR experiences to customers. However, it's not likely to market and sell its own headset to consumers, it wants to provide a reference blueprint for others to design around, using its hardware. "The Snapdragon VR820 integrates key technologies and features for an exceptional VR experience and provides a springboard for OEMs and developers to usher in the next generation of truly portable and untethered devices that we think are necessary for mass consumer adoption of VR," said Anthony Murray, senior vice president and general manager, IoT, Qualcomm Technologies International, Ltd.
Qualcomm developed the Snapdragon VR820 with Goertek, a Chinese electronics ODM. The reference design boasts a 1440x1440 AMOLED display at 70Hz per each eye and can handle 360-degree 4K playback at 70 frames per second with HEVC. It also has integrated eye tracking, dual front-facing cameras for six degrees of freedom, four microphones, and gyro, accelerometer, and magnetometer sensors. One way to view the Snapdragon VR820 is as a headset that's built the guts of a high-end smartphone. It's not as powerful as the Rift or Vive when tethered to a compatible PC, and the 70Hz refresh rate is lower than the 90Hz both alternatives are shooting for. But it's entirely wireless and, if ultimately successful at reducing the cost of entry to VR, could help promote the category and get more developers interested in building innovative games and applications. Qualcomm says it will have Snapdragon VR820 units available by the end of the year with commercial devices based on the platform expected not long after.